If you’ve been kind enough to stop by That One Pen on a consistent basis then you have noticed that things have been rather quiet around these parts for several weeks. The usual life events and extra busy times at work have made finding time for blogging a bit of a challenge. Also, some of my other interests have taken up more of my time as well. But, more importantly, I think I’m coming to the realization that I enjoy reading and tweeting about pens, pencils and paper more than I do blogging about them. If I’m being honest, the real bottom line is that all the other bloggers writing about pens, pencils and the like simply do it better. So, after a short 6 month run of doing some pen blogging, I think I’m going to hang things up for a while. I’m still going to be very active commenting on other sites, tweeting, etc. in the world of pens. In fact, I’ll probably be busier than ever with the twitters and the like because (a) I’m still obsessed with pens, pencils, etc. (probably more than I ever have been) and (b) there are so many great people in this world of pens etc. and I want to make sure I stay in the loop. So, ThatOnePen.com will be going into hibernation for the foreseeable future. I certainly won’t be shutting the site down just yet as the urge and capacity to pen blog may return some day. But for now, I’ll see everyone out there on twitter and all the other fantastic pen and pencil sites and blogs. I have had the Mover and Shaker from Tactile Turn for a couple of weeks now so I’m in a position to give some reasonably informed thoughts. I keep forgetting which is which, but I just looked it up again and the Mover is the longer pen and the Shaker is the shorter one. I guess I’ll try to remember that “smaller” and Shaker both start with the letter S. Anyway, the long and short of this review will be that these pens are (a) well made (b) offer a fair amount of refill flexibility and (c) a bit boring. 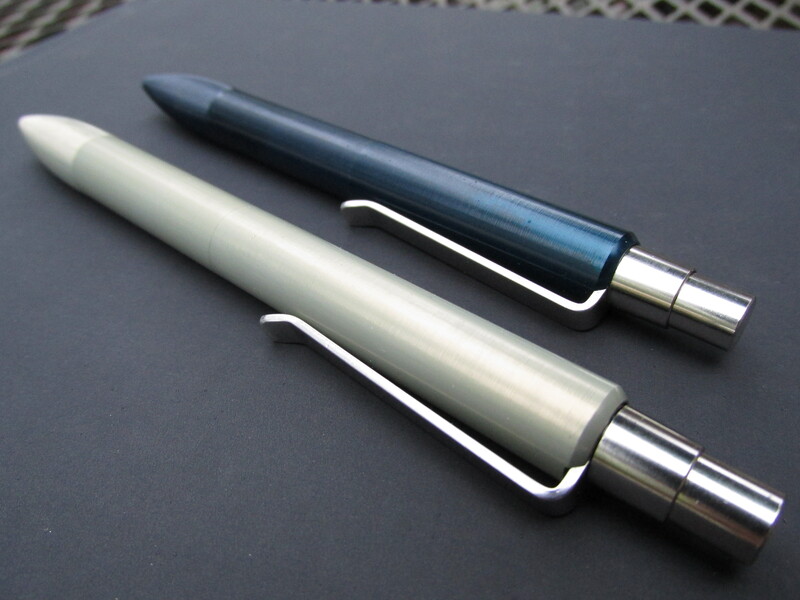 Pen fans likely know that machined pens have become rather popular thanks to funding sites like Kickstarter. In addition to these Tactile Turn pens, I have a couple of Retrakts from Karas Kustoms. Frankly, there isn’t a world of difference between the Mover and Shaker and the Retrakts. In fact, the longer Mover and the Retrakt have nearly identical lengths and weights. That said, there are a couple of important differences that have me favoring the Tactile Turn offerings, especially the shorter Shaker. The Shaker has spent the last couple of weeks as one of my pocket pens of choice. Initially, I did some hacking to get an Energel refill to fit the Shaker but ultimately decided that it was all a little too high maintenance for a pen that gives off an entirely utilitarian vibe. So, it’s now housing a medium blue Fisher Space Pen refill. For a pen that can go anywhere and tolerate all sorts of abuse, the write-anywhere Fisher refill seemed like a natural fit. My Mover is holding a 0.50 blue Pilot Juice refill which has the same dimensions as the Pilot G2 refill for which the pen was designed. 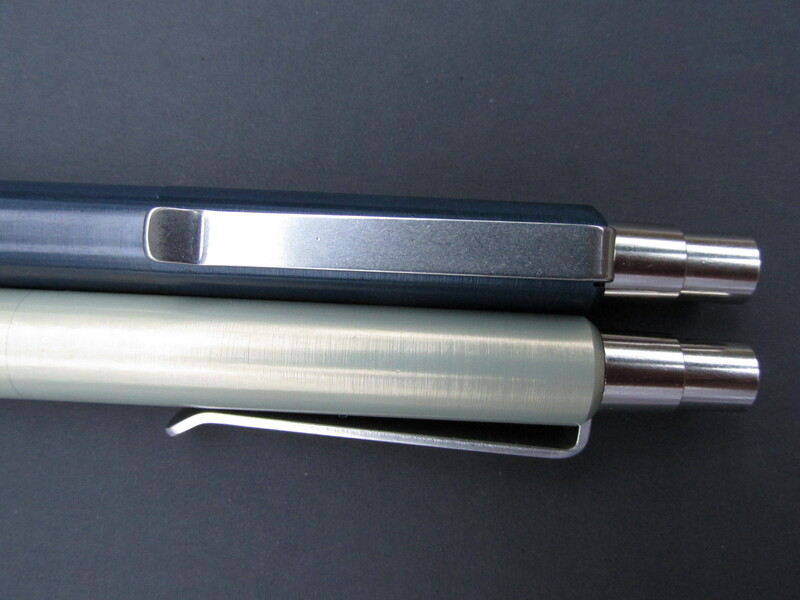 Refill considerations brings me to my two minor critiques of the pen design. When retracted, the tip of the Fisher refill resides too close to the opening of the Shaker. It turns out that this isn’t a huge deal because I clip pens to the front pants pocket and the Shaker’s short length prevents the tip from reaching the bottom of the pocket. However, if you keep pens in a shallow pocket, the proximity of the refill tip to the opening could give you some bleeding issues. 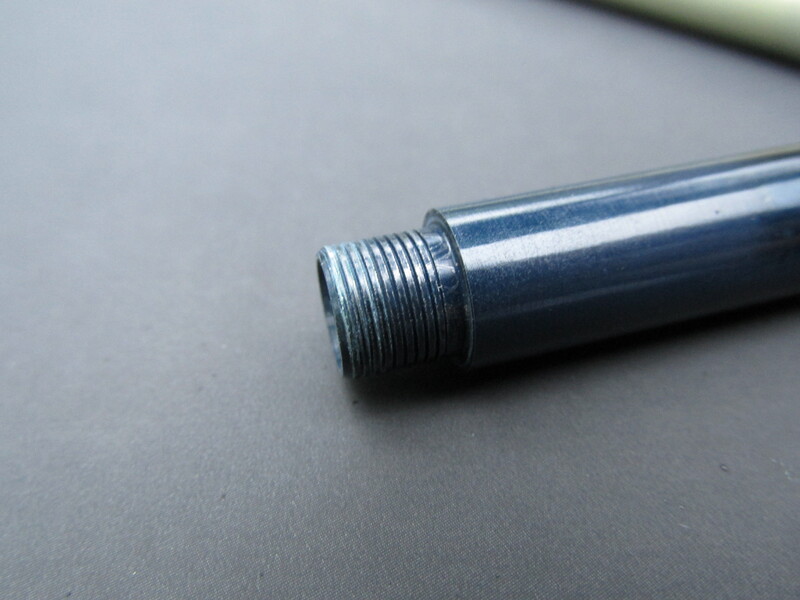 Second, the threads connecting the two halves of the pen are finely cut which can lead to off-center connections and potential thread stripping if you are not patient when changing refills. Also, you’ll definitely want to rub a bit of pencil graphite onto the threads to eliminate the annoying squeals machined threads often produce. The distinguishing feature of the Mover and Shaker is the grooved tip. It’s such a simple design element, but it’s amazing how much grip these grooves provide. Now, if you’re a high holder of pens (further from the tip) you’re unlikely to naturally find your fingers resting on the grooves. I suspect that I’m a bit of a high holder compared to most folks so my finger tips really only contact 0.5 to 1.0 cm of grooves. But, even that small amount of contact is enough to benefit from the trademark design feature. In fact, if you’re a low pen holder you may find yourself touching too many grooves and that you’re getting gecko like contact with the pen. As for the clip and knock, they’re both plain and entirely functional. The knock is the same one used by the folks at Karas Kustoms and delivers a smooth and nearly silent action. Earlier, I said these pens are a bit boring. While you take this as a criticism of the overall design (Seriously, look at the pen. It’s just sort of there), you can also think of it as a compliment regarding the no fuss user experience. It’s also a comment about the color I picked for my Mover. I forget what it’s called, but the cream/ivory/sand color of the larger pen was a bad call on my part. It’s a color you might see painted on the walls of the multipurpose room of a psychiatric facility. It might work for some, but I find myself wishing I went with something a bit bolder. Before I start wrapping up, I want to make one more comment about machined pens in general. Keep in mind that these pens are made of unforgiving metal and that you might experience a bit of finger tip fatigue with prolonged use. When I hold a pen, it tends to rest on the side of the top knuckle of my middle finger. With plastic or rubber or even acrylic pens, I won’t notice much fatigue on that part of my pen grip. 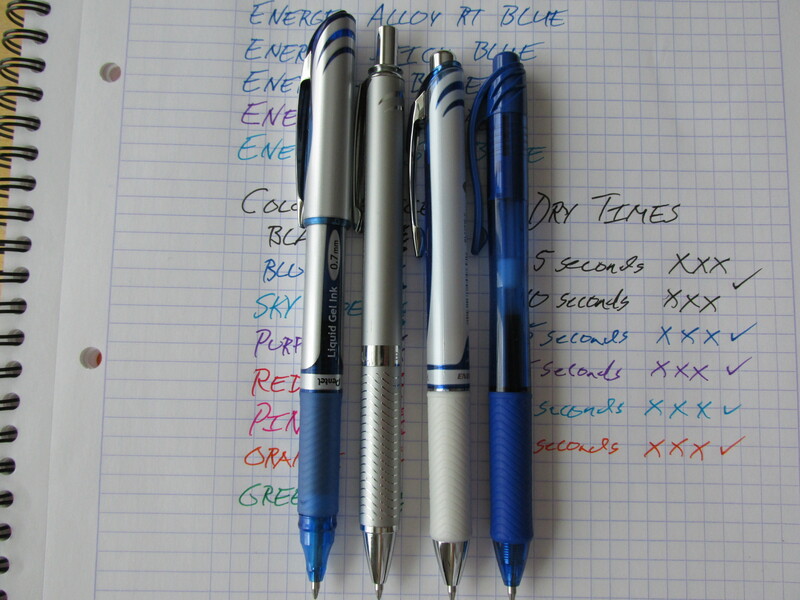 But, with harder pens, the pressure can become a bit uncomfortable over long periods. Your pen grip and experience may differ. So, should you get a Mover or Shaker? I would say probably “yes” to the Shaker and “maybe” to the Mover depending on your pen collection. 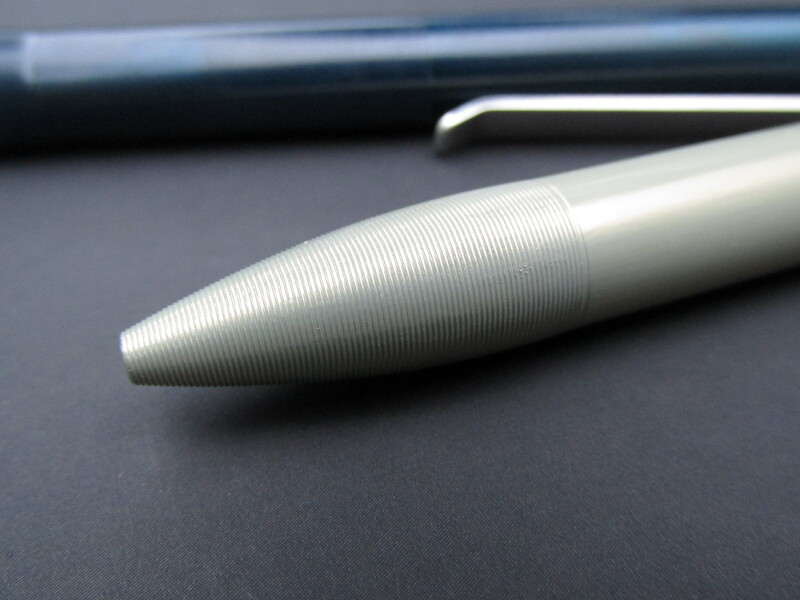 The smaller size of the Shaker makes it a more unique entry into the machined pen catalog. Also, machined pens are made to take a beating and the Shaker is easy to take with you thus offering the chance to take full advantage of its rock solid build. 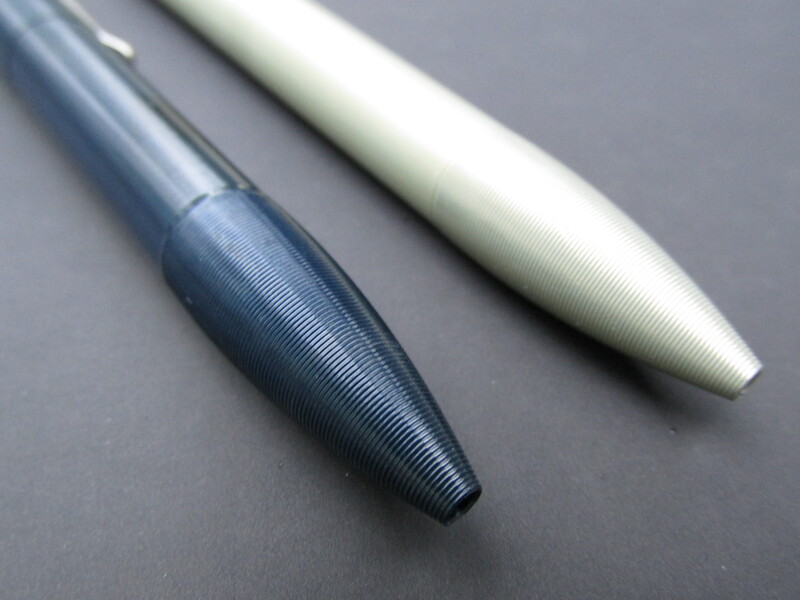 If you don’t have any similarly sized machined pens, then give the Mover a serious look as well. If you already have and enjoy something like the Retrakt, then the Mover will feel a touch redundant. That’s not to say the Retrakt is better than the Mover; they’re both quality pens. It’s just that they’re similar enough so having both pens may not be the most efficient use of your limited pen funds. 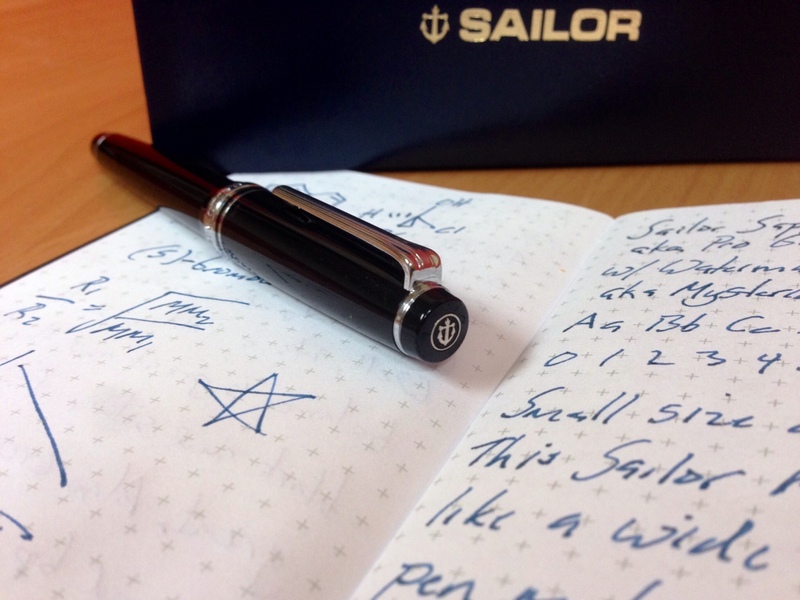 I’m now about five months and three dozen posts into my little corner of the pen blogosphere. While I’ve been into pens for as long as I can remember, reading, and now writing, about them on a consistent basis has led to many firsts for me over the past few months. Since starting the blog, I’ve been to my first pen show (two actually – Philly and Long Island) and bought my first vintage fountain pens (Parker 51 and Parker Vacumatic). 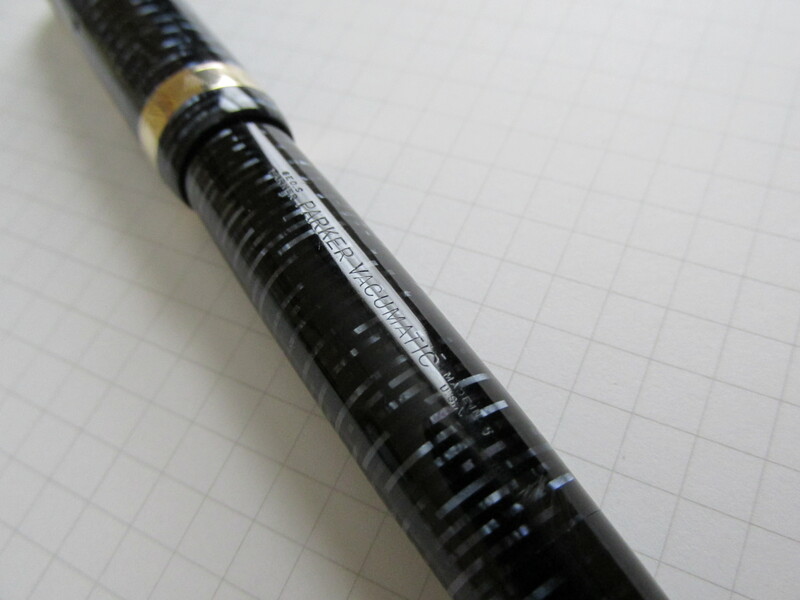 Of course, I’ve placed plenty of orders with various pen merchants before this blog came about but the rate of ordering has certainly increased. At this point, I own about 25 fountain pens, dozens upon dozens of ballpoint and gel pens and more pencils than I could possibly sharpen in the next 20 years (I won’t even mention the mechanical pencils and all the lead refills). Without a doubt, I have enough writing implements and ink to get me through this and several more lifetimes which means that the number of pens in the “don’t and will never use” bin is noticeably larger than the number of pens I currently or eventually will use anytime soon. There are days I look at the bins and bags of unused pens and think, “What the hell is wrong with me? !” However, that thought passes quickly and another order to Jet Pens or Goulet Pens or Anderson Pens or Amazon or so on or so on is placed and the cycle of, let’s call it what it is, addiction begins again. So, it seems that now is a good time to take stock and share with you which pens (and pencils) are getting a lot of use. This post is less a review of any pen(s) in particular and more about me trying to honestly assess my workflow and pen use. Let’s start with the pens that most frequently end up in my pants/shirt pocket. 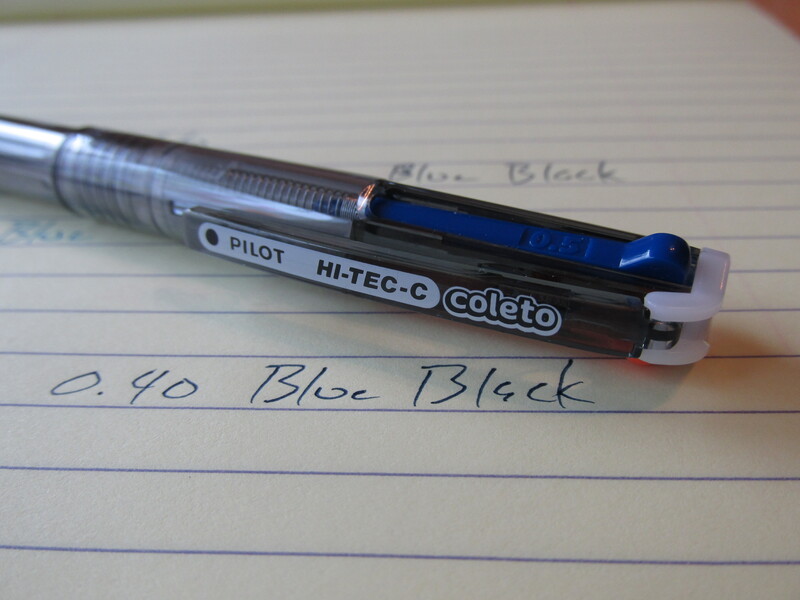 Most recently, I’ve kept the Hi-Tec-C Coleto 3 (blue, aqua blue and orange – all 0.5mm) and something holding an Energel 0.7 refill immediately handy. Typically, the Energel option comes in the form of a blue Energel-X in 0.7 mm. But, just a few days ago, I received my Tactile Turn Mover and Shaker pens and I did a bit of hacking to get the Energel refill into the smaller Shaker. So, right now, you’ll find me armed with the Coleto and the Energel-ized Shaker in my pants pocket. It doesn’t matter if I’m at work or running errands, the Energel/Coleto-3 combo is with me. I also typically have a Field Notes in my back pocket. Next, what do I typically have handy in the pen(cil) cups and customized Dudek pen holders at the home and work desks? As a science teacher, I do a fair amount of assessment item writing and solving and a good old-fashioned pencil works best here. 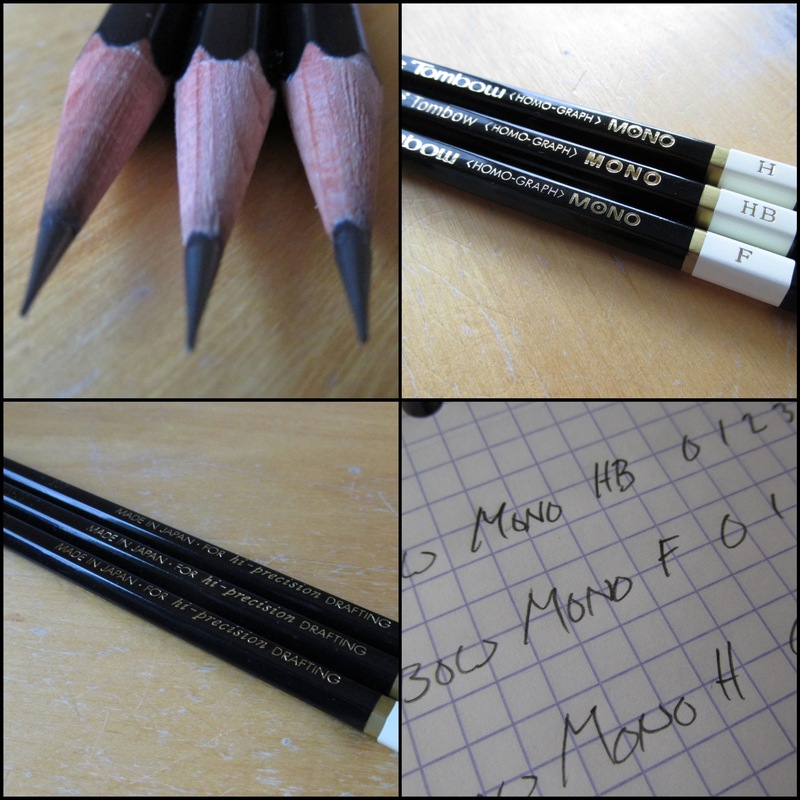 Currently, I’m keeping a number of Tombow Mono pencils in F and H grades at home and work. The harder graphite cores work well for someone who prefers a precise line and presses down a bit hard with his pencils. I recently bought a couple of Mitsu-bishi Hi-Uni pencils, also in F and H, and my magic 8 ball is predicting that these pencils will be taking up consistent residency on my desk soon. I also have number of mechanical pencils here and there, but nothing worth singling out as a true member of my writing implement family. 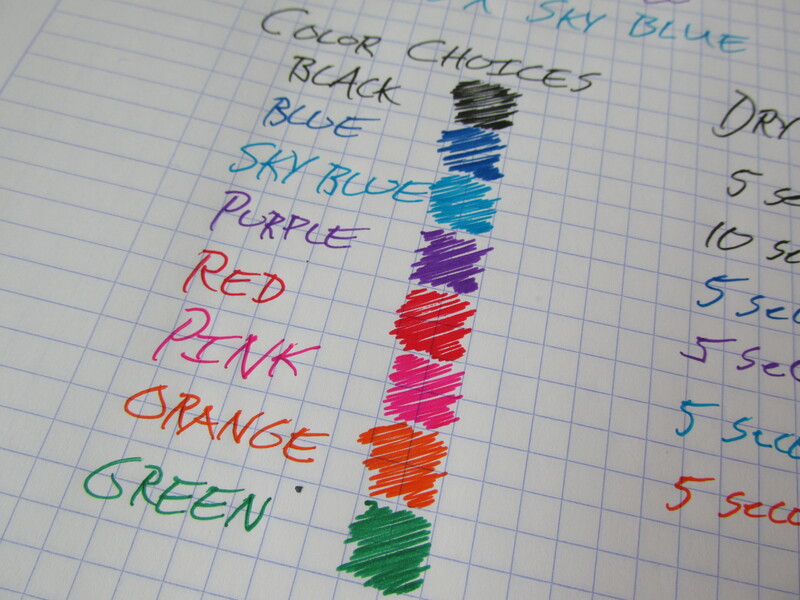 Also duplicated at home and work are various colors of Pentel Energel-X gels and Vicuna hybrid ink pens. These pens get used for grading the aforementioned assessment items. I’ve tried grading with fountain pens, but honestly, it just doesn’t work for me. The need to realign the nib and paper after each page turn exam after exam slows the grading process down too much. The fast-drying gel inks are a must as portions of the grading process are a flurry of check marks, “X”s and page turns and a slow drying ink would result in a stained mess. Which brings me to those pens that I carry with me wherever my briefcase goes, including home, work, business and personal trips. While there is a bit of coming and going in this category, the most frequent occupants of the briefcase pencase are TWSBI Mini, Kaweco AL Sport, Parker 51, Parker Vacumatic, Sailor Pro Gear Slim, Pelikan Souveran 405 (BP) and a Retro 51 rollerball of some sort. I don’t think I’ve ever carried ALL of these pens in my briefcase at the same time, but you can count on 4 or 5 of them being in there at any given moment. 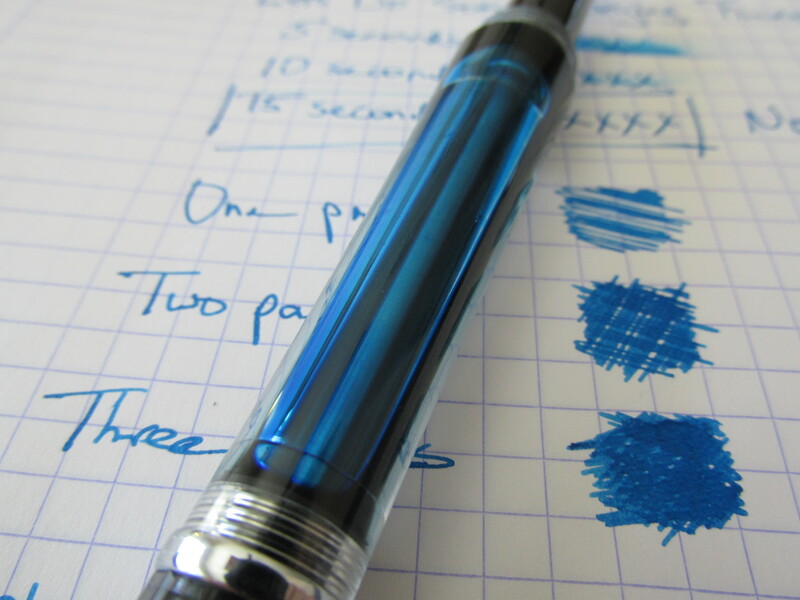 The TWSBI or Sailor often find themselves in the pocket for long stretches, but using a fountain pen in most work situations requires a conscious effort. This lack of consistent fountain pen use for quotidian tasks is something I plan to correct. Now that I have zeroed in on what I like in fountain pens and inks (fine line widths and somewhat dry writers), using them more frequently for even the most menial of tasks will be eaiser. So, when you add it all up, I generally have about 10 writing implements within arms reach one way or another at most times. Which brings me to another purpose for this post. Does having 10 or more writing implements this accessible make sense? I mean, I’ve only got one good writing hand and I’m certainly not some sort of artist who needs so many writing/drawing tools close at hand. I’m beginning to think I need to reduce my “pen footprint” and maybe start a “slow pen movement” to promote a more pen minimalist lifestyle. After all, wouldn’t fewer pens and pencils mean I get to know them and learn to write with them better and better as time passes? I’m going to think seriously about this approach. It certainly would be hard to narrow the options down, but I’m wondering if there might be a different form of happiness to be had by concentrating my use on fewer pens. And, afterall, this blog is called “That One Pen”. Getting to one pen will be wwwaaaayyyy too hard. But, can I get down to 3 or 4 writing implements? Probably not, but it might be fun, and instructive, to try. Maybe it’s all the snow that’s currently around me but I felt like I needed a larger white surface than the usual Field Notes memo book to review the TWSBI Vac 700. Actually, it’s more likely the fact that the Vac 700 is a beefy pen that I absolutely love writing with so, let’s stretch out a bit more for this review. You may also notice that I got a new camera and I’m playing around a bit with the photos. You’ll forgive me if some of the pictures are a bit gratuitous. Of all the TWSBI pens in my collection (Mini, Classic, 580 and Vac 700), the Vac 700 is the mac daddy of them all size wise. This is one serious looking pen. Actually, the Vac 700 may be the biggest pen I have period. When it comes to pairing pens with the Field Notes book in my pocket, the Vac 700 is certainly not the way I go most days. Still, I enjoy writing with the Vac 700 so much that I’ll cram it into my front pocket if I’m wearing jeans or other “comfort fit” pants with good-sized pockets. My Vac 700 has a fine nib and is shown here inked with Pilot Iroshizuku Kon-peki. There’s a cool feel to the Kon-peki that works well for a cold winter day and the blue pops nicely on the Rhodia graph I switched to for this review. Hopefully the new camera and the natural winter sunlight does the color and shading of this fantastic color a modicum of justice. I bought the Vac 700 from one of the few local merchants in my area that has a solid assortment of quality pens. I wasn’t looking for a Vac 700 that day and the store doesn’t typically carry much TWSBI stuff but I got lucky. They had one Vac 700 in my generally preferred nib size and I was able to talk them down a couple of bucks since I was also grabbing a Lamy Safari that day. As I recall, I got both pens for $85 which is pretty good for a brick and mortar store. It would have been a crime against serendipity to not get the pen, right?! How does the Vac 700 write? Extremely well. Other than a fine nib I got on my 580, all the TWSBI nibs have been rock solid for me right out of the box. (I’m not sure what’s up with the fine on the 580 but I might get one of those neat little nib kits from Goulet Pens and try to make some adjustements.) 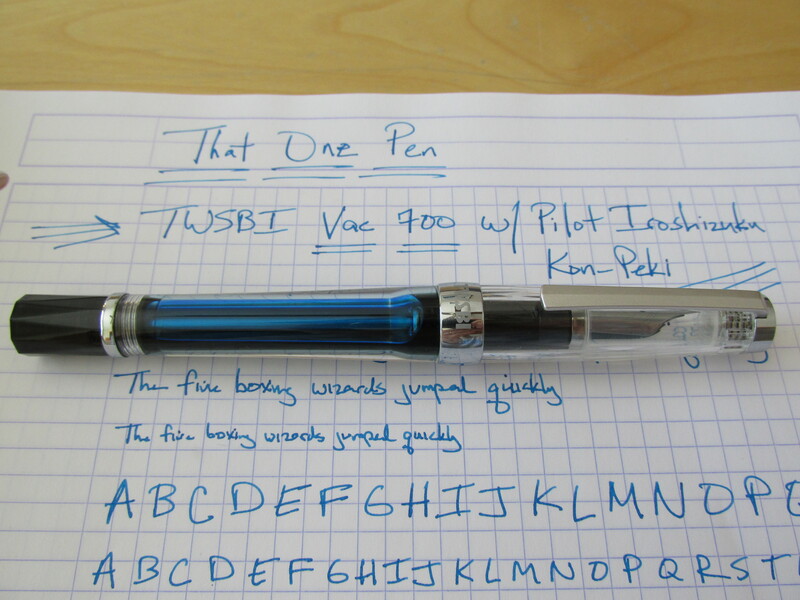 The Vac 700 writes a lot like my TWSBI Mini. This makes sense to me because the nib on the Vac 700 just looks like a larger version of the Mini nib. But, as you might expect based on the larger body size, the Vac 700 gives a bit of a heaftier ride than the Mini (see analogy). 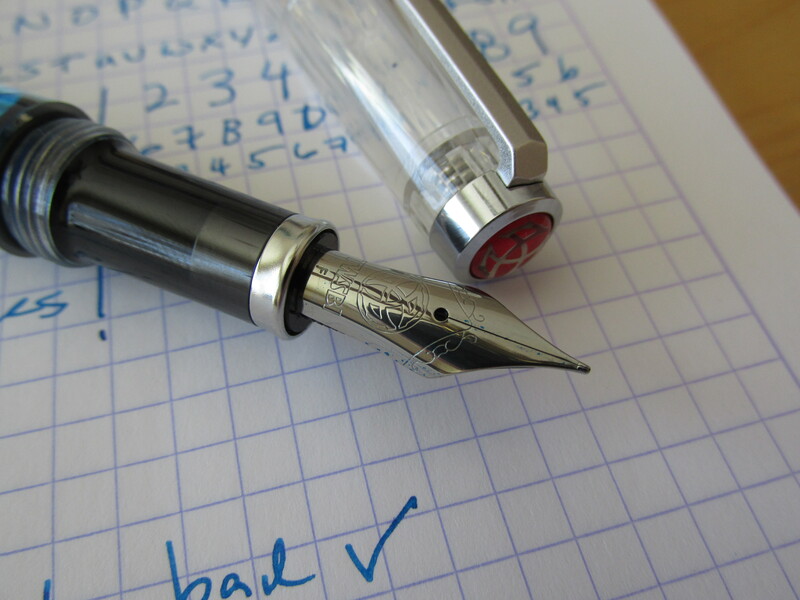 Like all TWSBI pens, the V7double0 (trying to be cool with the name now) is well made and feels like it will outlast its owner. The plunger system used to fill the pen works well and is a real rush. Make sure your hands are steady if you’re filling the VSeven00 from a typical bottle of ink. You need to depress the plunger fully and somewhat quickly to generate the vacuum that draws up the ink. A vacuum!! Again, don’t you see how pens and inks are really just handheld science projects!? 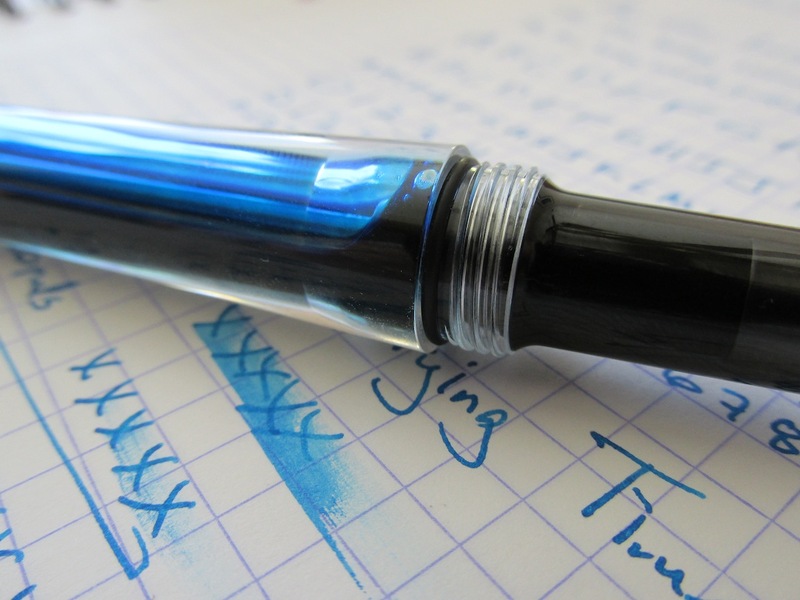 TWSBI does make a dedicated inkwell for the Vac 700 but such a thing just seems like an extravagance and we pen people aren’t into such well-designed extravagances. Oh wait, we absolutely are into such things. Darn it! I should have put the Vac 20 inkwell on my Christmas wish list. I really dig this pen. It’s typically my go to implement when the need to write with a larger pen strikes. It may not fit nicely into most pockets but it’s worth a bit of discomfort because the Vac700 is absolutely a “Carry It” pen for me. One source of criticism I have seen from others is the fact that there is a noticeable step down from the body to the grip sections. However, I find that that part of the pen gives me something to hold onto so it works for me. This is going to be somewhat of a boring analogy for a pen I’m clearly excited about but here goes. The TWSBI Vac 700 is the Honda CR-V to my TWSBI Mini Honda Civic. We recently became an all Honda family here at That One Pen when we purchased a Honda CR-V about 6 months ago. There are a lot of similarities to the way the Civic and the CR-V drive just as there are similarities between the Mini and the Vac 700. But the CR-V, like the Vac700, is the heavier option which leads to a slightly different feel. And now, thanks to some free photo editing software I just installed on my mac, here is a completely gratuitous collage of Vac700 and Kon-peki pictures. Welcome to That One Pen. 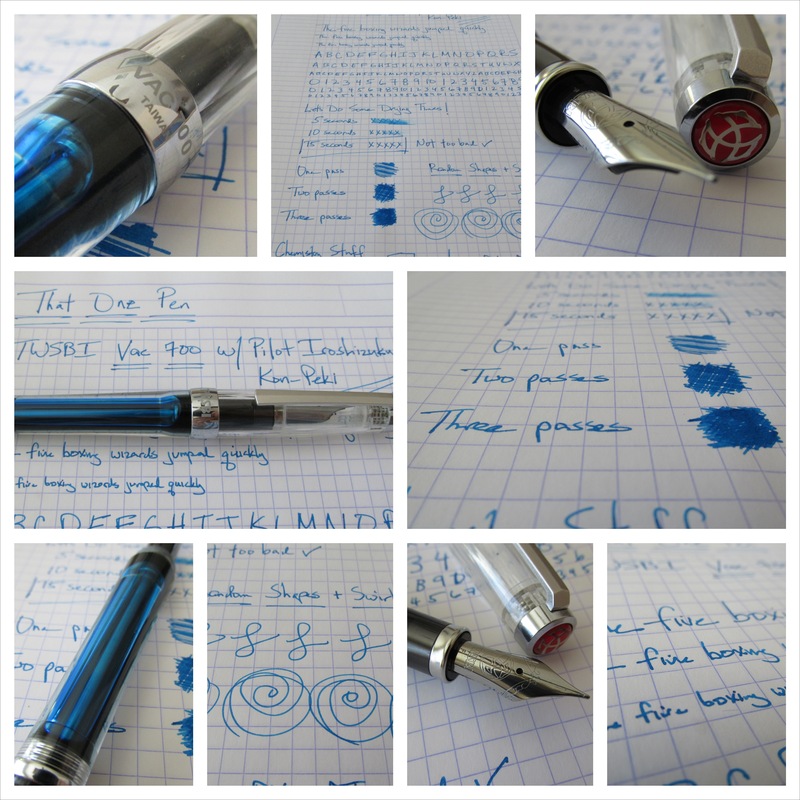 On this blog I’ll chronicle my search for that one perfect pen. Now, we all know I won’t find it but we also all know that the fun is in the search. But why blog about pens? Well, I like pens and apparently you do as well and that’s what blogs are all about – connecting with other people. As you can see from the blogroll, there are plenty of great pen blogs out there (send me a message and I’ll gladly add your blog to the roster), all of which have been around a lot longer than That One Pen but I hope to bring something new(ish) to the pen blog world. I’ll provide reviews and pictures like many of the other great sites, but hopefully my particular take on pens, inks, paper, etc. will be worth your occasional visit. I plan to take a straightforward and cheeky approach to pens as I try to be interesting and informative. Feel free to send me some feedback and please consider following me on twitter.